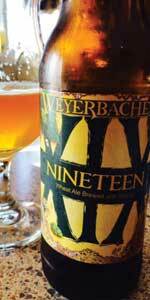 Nineteen (XIX - Wheat Ale Brewed with Mango) | Weyerbacher Brewing Co. Brewed to the classic Weyerbacher anniversary requirement of a strength of 10% ABV or more, Nineteen fits the mold and brings a new dimension to the anniversary pedigree – tartness! Two brews were made – a high-ABV mango-infused wheat beer and a tart blending beer, both using pale and wheat malts and a blend of Belgian yeasts. The final blended beer features both tropical sweetness, as well as the tart citrusy character of a spontaneously fermented beer. Nineteen should cellar quite well. Cheers! M: This beer is full bodied with a fairly creamy feel on the palate. Carbonation is soft but adequate for the style while the beer has a drying finish due to the ABV. O: Overall this one is a little simple but it's well executed. Good flavors but a bit lacking in complexity. Well crafted with minimal faults. It held up well to the age but probably should have been consumed fresh. If they make this again it's worth revisiting. Reviewed from (very long-standing) notes. Poured from a 12 oz. bottle into a Cigar City Brewing teku glass. A: Pours a hazy dark gold with a bit of chill haze to boot. Forms a one-finger white head that fades quickly. A fairly low amount of visible carbonation. S: Mango that's a little overripe or extra-sweet. Wheat grain with a bit of grist in the cracker malts. A bit perfumey as well. T: Ripe sweet mango that has just a bit of tartness to it. A lot of wheat malt adds a nice fullness to the flavor. There's fleshy fruits here as well - almost as if from yeast esters, though I'm not certain that it's not from the fruit additions. It finishes with some cracker malt sweetness under the full-fruited flavors whose sweetness lasts into the hang. The hint of lactic tartness lasts into the hang as well. M: A light crisp body, with nice carbonation sensation. Low alcohol presence. O: Not a bad wheat ale. Not my personal favorite, but maybe something I'd give someone who liked Blue Moon who was looking for something new and better and more complex. There's a lot of fruit flavor here, and it dominates just about everything else. Easy to drink but nothing I'd go back to. From the bottle: "Wheat Ale brewed with Mango". The bottle is dated 06/06/2014 with a "Best By" date of 06/06/2019, so I am in the window & sweet spot for the whole thing. There was some noticeable lees settled on the punt, so once I Pop!ped the cap, I employed a VERY gentle pour so as not to rouse them. They would not be wasted, either, just saved for the last pour. Color was solid Amber (SRM = > 7, < 9) with NE-quality clarity. An in-glass swirl raised just under two fingers of loamy, rocky, light-tan head with limited retention that left sticky lacing in its wake. Nose had a sharpness that I believe might have come from kettle-souring with lacto. I am not an expert by any stretch, but I think that I am beginning to recognize the odor. Mouthfeel was medium. The taste was fairly tart, not as puckering as Tarte Nouveau, but still noticeably tart. There was also a light fruitiness, but I would not have been able to identify it as mango on my own. Finish was dry, but the sweetness of the mango began to assert itself on the extreme finish. It was an interesting beer, but just not really my bag. A: A dark pineapple yellow, crazy hazy and a good amount of yeast sediment. Big white head on it though. S: Fruity and syrupy. Honey with a bit of a biscuit like aroma. Smells sweet and interesting. T: WHoa.. that's a surprise. Lemon and a bit of tartness. Some earthy bitterness in the finish with a touch of mango. M: Medium light with medium high carbonation. Dry finish with a touch of cling. O: Overall this is a damn weird beer. ABV is crazy high for the taste, it feels like a summer sipper, but packs a punch. Funky. Surprisingly refreshing for this alcohol content. Pours foggy with much mango sediment and very slight head, but is to be expected for this style. Mango provides a nice not-to-tart citrisy after taste. Very pleasant. Slight sour, good mango flavor. Worth drinking, and I really don't like wheat beers. Has the familiar sour nose. Tart body with a light mango finish. This is pretty refreshing and easy to forget it's 10%. I enjoyed this 12oz from a tumbler chilled. The color is golden amber with slight haze and visibly carbonated with thin white head that falls to a ring. The smell is very tropical with slight hint of vinous odor and mild mineral with sweet malt scent and mango-like fruity juicy smell. The feel is very tangy with lactic and slight spice accent with medium high carbonation and light sweetness with moderately high alcohol in texture with subtle acidity in the finish. The taste is tangy with mix of lemony lactic and slight herbal flavor with gently tropical flavor of mango with subtle wheat in the middle with slight malt sweetness and light spice with gentle herbal element in the dry finish. This is a good strong sour wheat however the alcohol makes this less drinkable as it nears cellar temp a little mild with mango taste may have been more enjoyable however the strength is very reasonable as far as a beer of 10% and fruity with an almost refreshing level of sourness. Nineteen (XIX - Wheat Ale Brewed with Mango) from Weyerbacher Brewing Co.